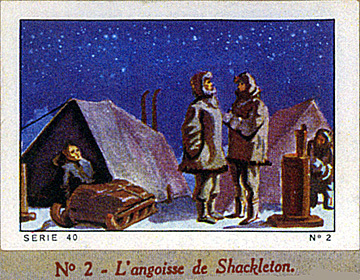 No 2 - L'angoisse de Shackleton. 104. LA CONQUÊTE DU PÔLE SUD. Issued by ? in Serie 40 of 12 cards. In this instance, the cards are mounted on two pages of text in French (not included here, other than the card titles). Size: Ca. 2.2" x 1.57". Recto: Various scenes. At lower left: Serie 40. At lower right: Card number [1-12]. Verso: Unknown as these are mounted in an album. The titles below are printed on the album pages. Further Note: "These (076 and 104) both come from the same Nestle chocolate album: Album Nestle 1935-1936 Sports, Contes, Explorations. Series 39—La Conquete du Pole Nord—consists of 12 cards, of which no.9 is Amundsen. Series 40—La Conquete du Pole Sud—consists of 12 cards, which are as listed on your site. As well as these, Nestle also produced another 12 cards, in their next album: Album Nestle 1936-1937 Sports, Contes, Explorations, Paysages de France. 12. Retour au quartier general"
104.2 No 2 - L'angoisse de Shackleton.